Flat rotation extractor is very popular to many kinds of pre-pressed cake. Rotation Cell at the high bin level makes it easy to form immersion vegetable oil extraction way and reduces meal fines in miscella. The Flat rotation extractor adopts rack driving system. All this will help to improve the quality of crude oil and reduce scaling in the evaporation system. Out double layers Rotation Extractor has strong oil extraction power. 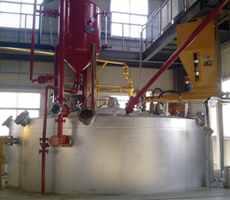 It can be used for vegetable oil extraction from oilseeds. Expanded oil materials and pre-pressed cakes with the oil content of 25~35%. After vegetable oil extraction, oil residue in meal is reduced to less than 1%. Unique rotor balancing ensures less power consumption, less maintenance and no loud noise. Rotation speed of Air Lock and Rotor Extractor can be adjusted automatically according to incoming oilseeds quantity to ensure that the bin level is stable. This will help to form micro negative pressure in the Extractor and prevent solvent escaping out from the Extractor. Process of miscella circulation is improved to reduce solvent use, Solvent residue in meal and increases miscella concentration. Engery Is saved by reducing the evaporation quantity. We have rich experience of manufacturing and exporting large selection of various vegetable oil extraction machinery for different using purposes and our clients are very satisfied with our machines. We offer the best service and the most competitive prices with our solvent extraction plant and oil extraction machinery. If you prefer to know more infoabout our solvent extraction plant or vegetable oil extraction palnt, please don’t hesitate to contact us, we are always at your service!